Two years ago, when Dustin Moskovitz announced he was leaving Facebook to start a new company with fellow-Facebooker Justin Rosenstein most people thought one of two things: He’d had a falling out with Mark Zuckerberg or he was just crazy. What could be more exciting than Facebook? Moskovitz, of course, was Zuckerberg’s college roommate and co-founder of Facebook. If you get your Facebook history from Aaron Sorkin, he was the guy coding away in silence while half-naked girls did bong hits. If you get your Facebook history from, you know, things that actually happened, Moskovitz outlasted any other co-founder and easily played one of the most pivotal roles in the company’s early years. As such, Asana will get more attention and scrutiny and maybe even hype than most business software startups. But here’s the thing: Asana deserves it. As it turns out neither of the suppositions for Moskovitz’s decision to leave were right. Moskovitz and Rosenstein just had a really big idea: To fix how people collaborate on projects and work in teams. Something that has so far been unfixable despite billions spent on developing an implementing collaboration and communication software. Something that may be so rooted in the idiosyncrasies of human behavior that it may not be fixable. 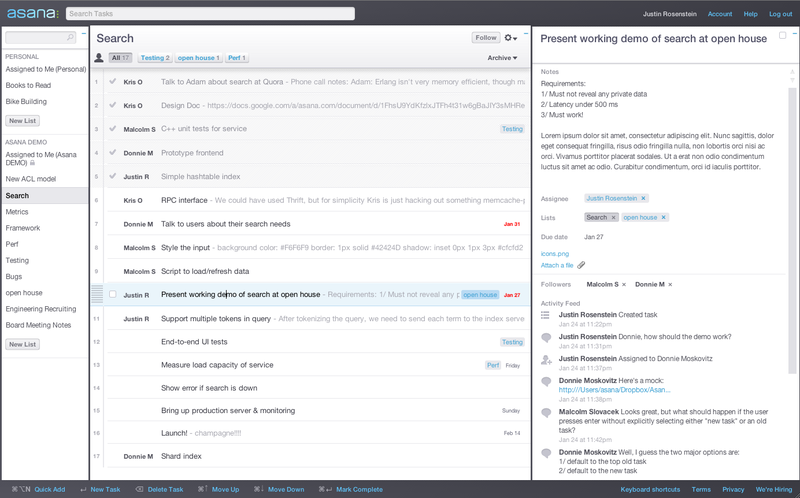 But Asana’s opening salvo is pretty impressive. There’s a full demo of the software in the video below, from Asana’s recent friends-and-family open house, so I won’t belabor the features here. (Screen shot is below.) Hear the pitch from the founders yourself. The company is still in private-beta, and it has a 1,200-company waiting list to get an invite. It’ll be opening up more over the course of this year. Asana has raised just over $10 million from several angels, Benchmark Capital and Andreessen Horowitz. For me, Asana is the most exciting company to spin out of the early “Facebook mafia”– despite the runaway hype of Quora and Google’s jaw-dropping $120 million offer to buy Path. Then again, I’m sort of a business software nerd. I’ve been waiting for this “new generation” of enterprise software companies everyone keeps talking about and mostly feel like the open source and software as a service generations were a let down. These companies changed the way software was priced, delivered and implemented, disrupting old giants, and that’s no small feat. But product-wise, the reinvention of these categories wasn’t as dramatic as salesmen-oriented CEOs would have you believe. Yammer certainly got closer than most to delivering on that buzz phrase “the consumerization of enterprise,” but it was mostly by applying what was working for Twitter to a work-safe, secure app. But Asana is strikingly different than other collaboration software. Part of that is timing. “I think that web technology has developed to a point where you can have a really great experience in the browser, better than you can have in a desktop app,” says Benchmark’s Matt Cohler. “The Asana team spent a fair amount of time investing in the underlying framework and technology to take advantage of what you couldn’t do a few years ago.” And part of it is because Asana is one of the first business software products re-thought from the ground up by twenty-somethings with no background in old-style enterprise sales and frankly, not too much experience using enterprise software in the workplace. But here’s what jumped out at me watching it: You can tell Asana was co-created by one of the founders of Facebook. There’s that almost hubristic mission: To fix how people work together and make the global work place a better, more efficient, less frustrating place. “It was a precondition to leaving Facebook that I wasn’t going to start something that was just about chasing money,” Moskovitz says. There’s that Facebook-like obsession with efficiency, organizing inherently messy, social things with newsfeeds, updates and clean design. Pragmatism and data-driven decision making rule the company. Frugality is important but not everything. Asana’s engineers– the Gods of the company– get a $10,000 budget to pimp out their desks. Moskovitz shrugs and says he thinks it should be more, but couldn’t come up with anything they’d need that would cost more than $10,000. And like Facebook’s early obsession with being a “utility,” Asana wants people to live in this app throughout their work day. Like Facebook did away with the clutter and needless page view clicks of the MySpace world, so too is Asana obsessed with speed. They know that if the software is the least bit cumbersome to use, employees won’t use it. Like Facebook, Asana sees its eventual customer base as, well, everyone. They hope people won’t just use Asana for work, but for things like wedding planning. The two wanted to build this product because managing teams at Facebook was such a chore. In a sense, Moskovitz says he’s still working for Facebook, because he’s still trying to solve the problem he was trying to solve there. It just so happens, he’s also trying to solve that problem for every company in the world. But all that said, this is in no way another “Facebook for the enterprise.” There’s no list of friends, no events, no photosharing. Asana isn’t about making the workplace “fun” or making it social for the sake of social. Its not about organizing your social graph. It’s about helping people work together more efficiently– cutting out reliance on email, cutting down on the need for those endless meetings, easily assigning and tracking tasks in one instance that is always up to date, because unlike those lame corporate wikis, people are living in the app. Moskovitz and Rosenstein are clear: If they don’t accomplish that, they have failed.